I have been trying to learn to read, write and speak Mandarin all my life, but to no avail. When I went to university, I tried again but it didn't go further than just one year of classes and soon enough, with no practice and no interest in pursuing it further, I lost all that I have learnt. When I started work, I bought books but they stayed on the shelves. Many years have passed since then and now I am trying again. And I certainly hope it will come to something. 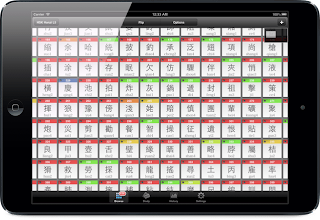 I have purchased an iPhone/iPad app from StickyStudy, and after just two days with it, it seems promising. Here is how it looks like and it works perfectly on my iPhone as flashcards. I have also downloaded a pinyin bible to read, and like when I was learning NT Greek that John is simple enough in Greek to practice and learn the language, it seems to me to be the same in Mandarin. I only hope that this is not just a new toy, or in my context, old tricks that didn't work.